The People's Committee of Tay Ninh province yesterday licensed three foreign investment projects with total capital of US$ 325 million. According to a report of the People’s Committee of Tay Ninh province at an overview conference of foreign direct investment (FDI) attraction during past 25 year, the Southwestern province received around 291 projects from 25 worldwide countries and territories with their registered capital of US$ 5.78 billion in December, 2018.
around US$ 3.14 billion, occupied about 54.5 percent of the total registered capital. 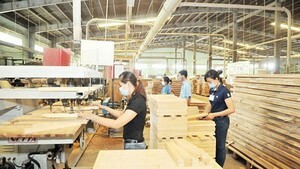 The FDI enterprises have attracted 113,298 labors, including 110,864 Vietnamese workers working in these enterprises.